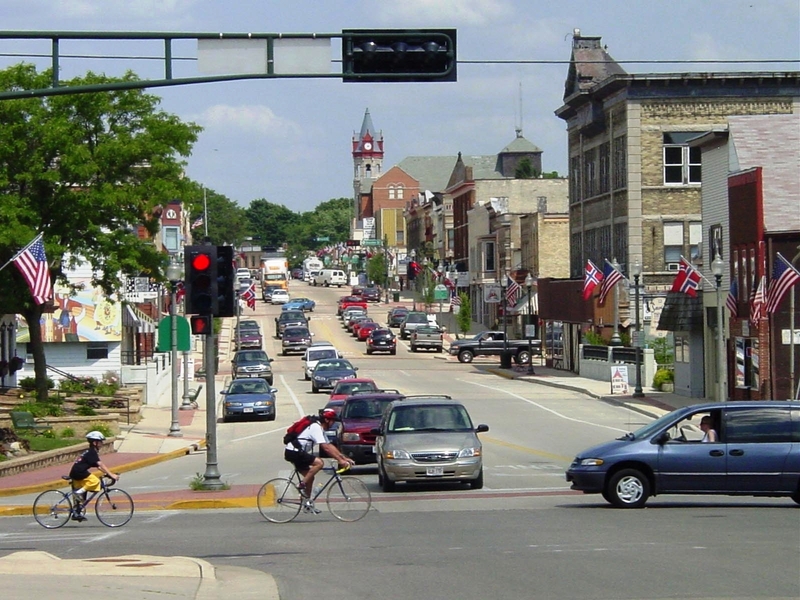 Stoughton, Wisconsin, (population 12,646), situated on the Yahara River, was founded in 1847 by Luke Stoughton, an English immigrant from Vermont. Stoughton was responsible for the construction of a lumber mill, gristmill, and general store. With the economic backbone of the community in place, he secured the passage of the railroad through the town, enabling continued growth. The village of Stoughton was incorporated 1862 and became a city in 1882. In the late 19th century a Norwegian immigrant named Targe G. Mandt founded a large wagon factory in Stoughton and employed hundreds of Norwegians. Tobacco also became an important local crop, employing hundreds of people in the city’s 17 tobacco warehouses. Throughout the middle of the 20th century, Stoughton’s economy was based on the manufacture of exhaust mufflers and tractor-trailers. Today, the city maintains its rich Norwegian heritage and has a thriving business and commercial base, with more than 200 large and small businesses. Stoughton is engaged in a façade improvement and revitalization project for its historic downtown. Walking tours are available through the downtown and three other historic districts. Stoughton’s 1900 Opera House has been restored to its former glory and hosts a full season of popular music and opera. The Stoughton Historical Museum is housed in the former First Universalist Church, built in 1858, and features an operational 1925 fire truck and a 1910 printing press. The Norwegian heritage of many of Stoughton’s citizens is celebrated at the annual Syttende Mai (Seventeenth of May) Festival, which attracts nearly 15,000 visitors each year. Other annual celebrations include the Norse Afternoon of Fun in February, the August Coffee Break Festival, and the Victorian Holiday Weekend in early winter.